It seems to be happening a lot lately – one guy comes into the majors with a substantial amount of hype surrounding him and then he goes on to exceed said hype in a very small amount of time. 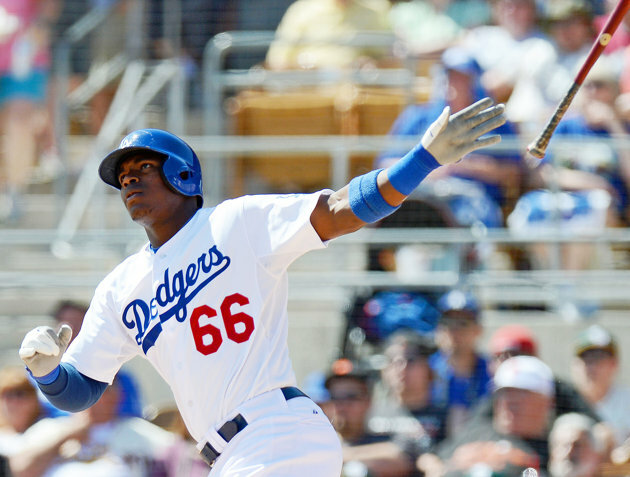 The latest name to captivate the baseball world is Yasiel Puig, a Cuban defector who has become a fan favorite in LA and must-see TV for any baseball fan. Last year, Trout and especially Harper had a lot to live up when making their major league debuts but the two franchise players did more than live up to the hype. They both won rookie of the year and Trout made a strong case for American League MVP. Matt Harvey also burst onto the scene last year and gave a discouraged and pessimistic fan base some hope for the future. Fellow Cuban Yoenis Cespedes didn’t make a quiet transition to the majors either. Yu Darvish, Manny Machado, Shelby Miller or any one of the other many Cardinals starters who have dominated recently – the list of guys making the most of their first big league opportunities goes on and on. Even going back 3 years ago for Strasburg’s debut in which he struck out 14 Pirates, Bob Costas summed it up best when he said “all the superlatives seem to apply. ” That statement also applies to Puig. In his first 5 games, he is hitting .421 (8-for-19) with 4 HR and 10 RBI – and oh yeah the Dodger have 4 of those 5 games. Puig is the 2nd player since 1900 to hit 4 HR in his first 5 career games and he is just the 3rd player since 1920 (when RBI became an official stat) to have 10 RBI in his first 5 career games. An amazing start that has the baseball world buzzing. The 22-year old was the topic of a lot of offseason conversation and became the subject of a bidding war that the Dodgers ultimately won with a 7-year $42M offer, setting the record for a Cuban defecting to the majors. According to Jon Heyman, that wasn’t even his highest offer. He came in with a lot of hype, helped that hype grow by having a monster Spring Training (.517 AVG in 27 games) and now he is surpassing everyone’s expectations, even leaving Vin Scully speechless. Of course, it’s an often road to becoming an overnight sensation, especially when you must defect from your home country as a well-written LA Times article explains but he’s got the baseball world in the palm of his hand right now. I can’t wait to see what he does next and if the recent trend in any indication, there should be another young player right behind him ready to take the league by storm.